This week we are experiencing two new things in India. The first is the Ganesha Chaturthi holiday. Last Thursday was the day before the holiday when you celebrate the elephant god Ganesha’s mother – Gauri. 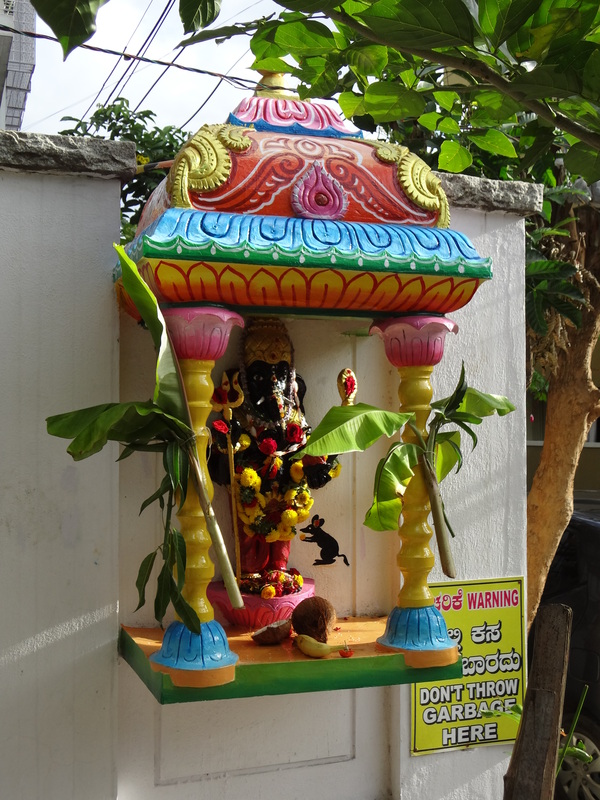 Schools were closed for the day and then also for the Ganesha Chaturthi, the big holiday, on Friday. I have been in India around this time before, but I had no idea what I was in for this time. There is a temple down the street that has strung up lights and loud speakers. Yup, that’s right, LOUD SPEAKERS. Starting Friday morning they began playing music and chanting from 7:30 in the morning until 10 or so at night. I was told this would go on for the whole weekend and it did, and then some. 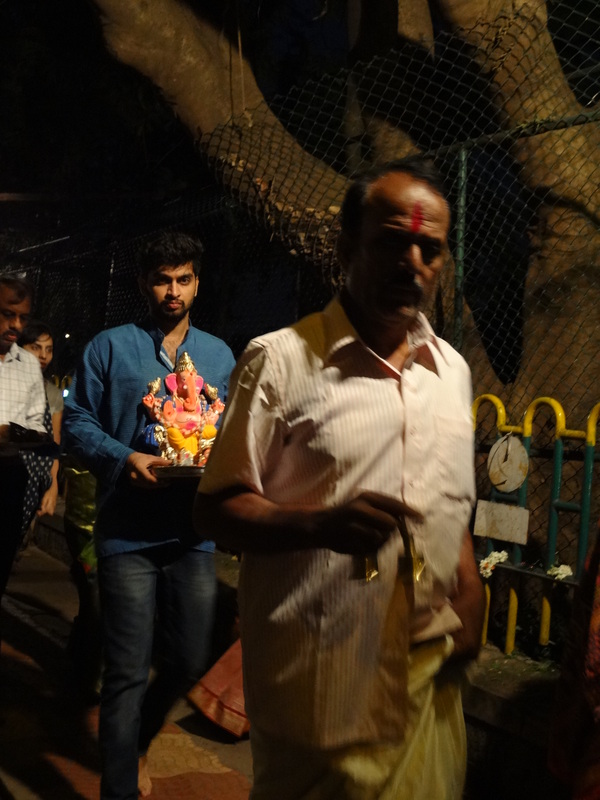 At night, everyone goes to Sankey Tank, which is the lake down the road, with the clay Ganesha they have purchased and submerge it in the water. 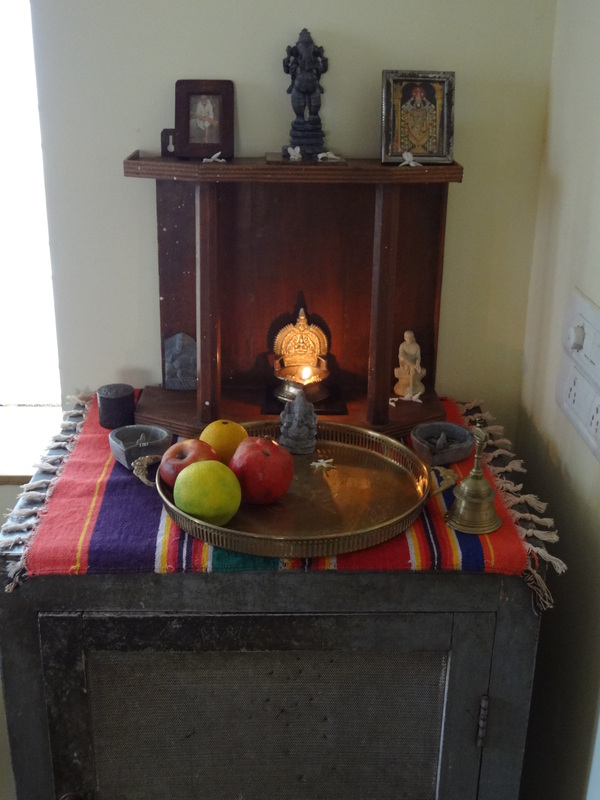 Some are just quiet families, having a puja or blessing and submerging their god. Others are bands of raucous young men, dancing, jumping, chanting, beating drums, blowing horns and lighting fire crackers in the street on the way to the tank with their idol. Each temple displays a large Ganesha for the weekend and then have a procession down to the tank at night that blocks the roads and creates a deafening sound. I thought it was all over last night until I heard the drums again. It goes on for an hour or two and then the fire crackers go off in great strings, producing clouds of smoke. It is thrilling and beautiful, scary and obnoxious, and I’m still not sure if it’s over yet! The other new thing this week is Ashwin’s first day of school in India. He went off reluctantly but quietly yesterday. We have been talking about this a lot and I think he knew it had to happen. When he came home he was a different boy. 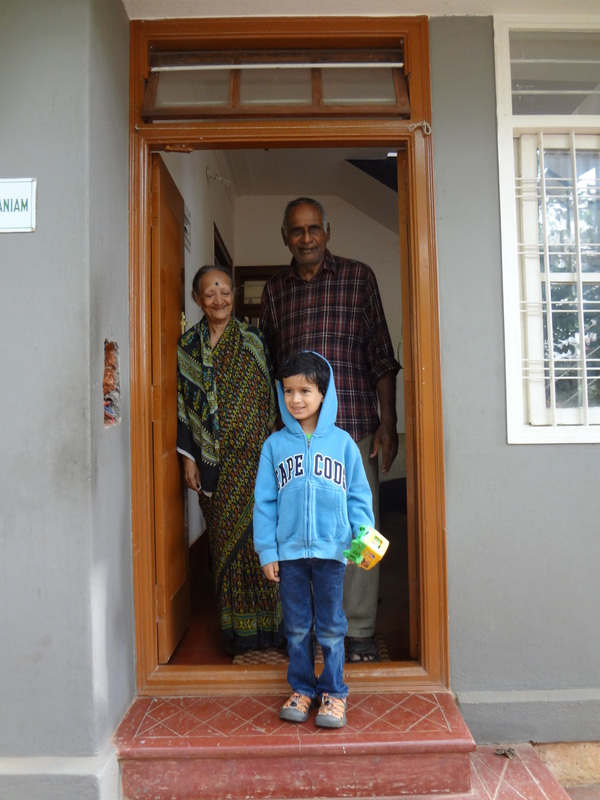 They had given him books and a backpack, and he was thrilled to be learning new things. He couldn’t wait to do his homework and he was being loud and talkative all afternoon. When he woke up this morning he said he was excited, but as the time approached to take him to school, he said he didn’t want to go. Leaving him this morning was a huge production and I finally had to put his hand into the teachers to lead him away as he was screaming and crying. It was a gut wrenching experience and I hope it goes better tomorrow. His teacher is very nice and his class is small, only about 8 kids. I expect he’ll settle in soon, but I haven’t seen him this upset in a long time, and the last thing I wanted to do was leave him. Every day in India seems to bring something new with it, we just have to go for the ride. Awe, I hope Ashwin had a fun second day at school. It sounded like he loved the first day so wonder what happened. Happy Ganesha Caturthi Day to all.